How to disable restricted mode: Are you getting a message from YouTube saying “This video is unavailable with Restricted Mode enabled. To view this video, you need to disable Restricted Mode.”. Are you annoyed with this? You are in the right place! Usually, this alert pops up when the video contains any kind of explicit content or adult content or the video might have been flagged by other viewers. This makes the video restricted to only certain age group people to access and watch those videos. Given below are two working ways to get rid of this alert and enjoy watching YouTube videos without any restrictions. If you are above 18 years of age then it is as simple as logging into your YouTube so that YouTube recognises your age and makes the video available to watch to you. If you are not above 18 and still want to watch the video then you might have to go with the second method. There is an option to disable Restricted Mode which is located at the bottom of YouTube.com, you can simply toggle it to “off” and hit the “save” bottom after which the page refreshes and you should be able to watch your restricted video now. There you go! You have successfully removed the Restricted Mode from your YouTube. So that was how to disable restricted mode on YouTube, if you liked the article then there is a video portraying the same below. Make sure to check that out for more detailed explanation. If you have any problem disabling the Restricted Mode leave a comment below and I will get back to you as soon as possible. 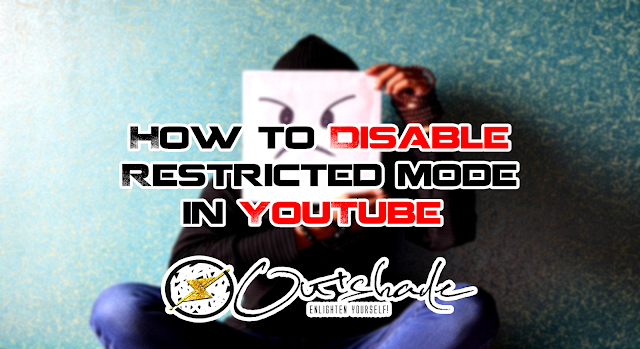 Also, if you found our video on how to disable restricted mode on YouTube interesting then do not forget to subscribe to Outshade YouTube channel. Founder and Chief editor at Outshade.com, a leading online portal for all top and viral articles from around the globe. I want to view entertainment video. I am above 50years of age. You can simply sign in to your YouTube account and you should be able to watch the video. Great article.Thank you,Is there any new updates are there?? ?